The tens of thousands of solar panels resting on the surface of the Yamakura dam reservoir have finally begun to earn their keep. 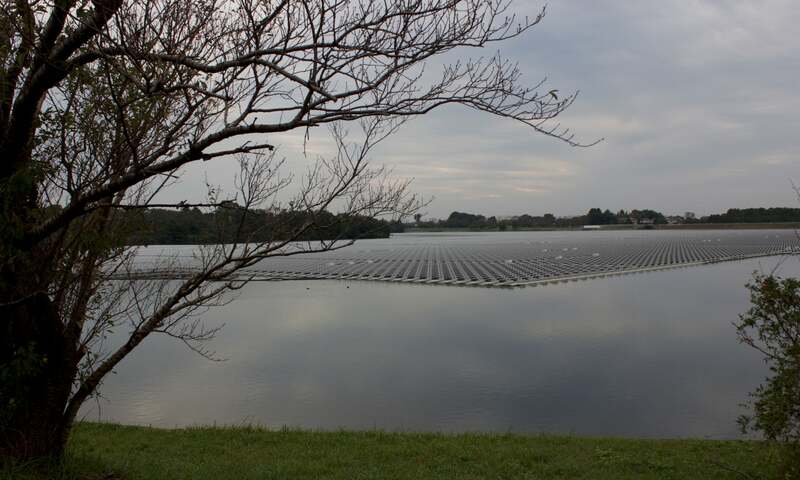 This floating solar farm in Chiba prefecture is the biggest of its kind in Japan – and one of the largest in the world – covering 180,000 square metres, or roughly equivalent to 25 Wembley stadium pitches. Over the next two decades its 51,000 solar panels will generate an estimated 16,170 megawatt hours annually — enough to power thousands of local households. In the post-Fukushima era, local authorities around Japan are courting private investment in renewables as part of a push to dramatically increase their share of the national energy mix. The project, along with dozens of other large-scale solar farms, is also supposed to help Japan – the world’s fifth-biggest carbon emitter – honour its Paris climate agreement vow to cut carbon emissions by 26% by 2030 from 2013 levels. But while most residents support the Yamakura plant’s construction, in other parts of Chiba prefecture campaigners say the rush to blanket large areas with solar panels has the potential to unleash environmental catastrophes, even as they lower CO2 emissions. Pressure on Japan to increase renewables’ share of the energy mix means the number of large-scale solar farms is expected to rise. But, far from welcoming the dawn of a new age of clean energy on their doorstep, residents near the proposed site of a huge solar farm in the city of Kamogawa are mounting a last-ditch effort to prevent its construction. To make the Kamogawa mega solar plant, developers will destroy 300 hectares of pristine forest. The irony of chopping down trees, which absorb CO2 in the air as they grow, to replace them with a solar plant has not been lost on campaigners, who claim the facility will destroy the natural environment and put the area at the mercy of the elements. Of all of the countries investing in renewables, few are as in need of a fundamental rethink on energy policy as Japan. The country recently marked the seventh anniversary of the tsunami disaster and Fukushima meltdown – which resulted in the closure of dozens of nuclear reactors – yet it still lags behind other countries in clean energy development. China is by far the biggest investor in renewables, according to a 2017 report by the International Energy Agency. By 2022, the report said, solar and wind capacity in China could reach twice Japan’s current total power capacity. Over the next four years, the growth in renewable energy capacity in the US, India and the European Union are forecast to outstrip that in Japan. According to the ministry of economy, trade and industry, renewable energy accounts for almost 15% of Japan’ energy mix but is dwarfed by coal at 30% and liquefied natural gas at almost 40%. In response, the government is aiming to increase renewables’ share to between 22% and 24% by 2030 – a target described as “ambitious” by the prime minister, Shinzo Abe, but criticised by his foreign minister, Taro Kono. “For too long, Japan has turned a blind eye to global trends, such as the dramatic decrease in the price of renewables and the inevitable shift to decarbonisation in the face of climate change,” Kono told a meeting of the International Renewable Energy Agency in the United Arab Emirates earlier this year. The company behind the Kamogawa mega solar plant has vowed to spare trees on half of the site but that gesture will not be enough to save local wildlife, according to Noriyuki Imanishi, who heads a local group opposing the Kamogawa plant. A Chiba prefectural official said solar plants were part of the central government’s drive to promote renewables. “We’re aware that there is opposition and we now take a more holistic approach to building new facilities so that we can gain the understanding of the local community,” he said. Chiba prefecture, which is served by the electricity company Tepco, is one of several local regions that are courting private renewable investors, offering public land for the construction of ever-larger solar farms on land and water. Developers, meanwhile, are seeking bigger, more economical, sites – which come at a premium in a mountainous country with a large coastal population, and where large tracts of flat land are hard to come by. “After the Fukushima disaster we identified the need to diversify our energy supply to include solar, wind and micro-hydroelectric, and at the same time stimulate the local economy,” said Kouichi Ishige, a deputy director in the prefecture’s industrial waterworks bureau. In its 2017 report on the industry, the Japan Renewable Energy Institute noted mounting concern about the impact mega plants were having on areas of natural and historical importance, echoing campaigners’ fears that the destruction of heavily wooded, mountainous land could increase the risk posed by floods and landslides. Mega solar projects are under construction in other parts of the country, including in areas of natural beauty such as the Izu peninsula and Nikko, a national park. But as long as local authorities see mega solar plants as a source of tax revenue – as well as cheap electricity – opponents appear powerless to halt their construction.